Nuon Chea, who was known as Brother No. 2 in the former Khmer Rouge government after the late Pol Pot, faces a U.N.-backed tribunal in Phnom Penh. The image is taken from a screen in the press room. THE TOP FOUR surviving members of the brutal Khmer Rouge regime have gone on trial before a tribunal aimed at finding justice for the estimated 1.7 million people who died in Cambodia’s “killing fields” of the 1970s. With the aging leaders all in their late 70s or early 80s and with Khmer Rouge overlord Pol Pot long dead, the trial before the U.N.-backed panel represents the last, best chance for Cambodia to bring accountability to the Khmer Rouge leadership blamed for the deaths. All four of the defendants say they are innocent. On trial are Nuon Chea, 84, who was Pol Pot’s No. 2 and the group’s chief ideologist; Khieu Samphan, 79, the former head of state; Ieng Sary, 85, the former foreign minister, and his wife, Ieng Thirith, 79, who served as minister for social affairs. Chief judge Nil Nonn opened the court session with procedural matters, including reading out the charges against the four, which include crimes against humanity, war crimes, genocide, religious persecution, homicide and torture. Cambodian victims’ advocates have decried how long it has taken to launch the trial, saying the proceedings are needed to shed light on a dark period and that time is running out for drawing meaningful testimony from the defendants on the stand. Although all four defendants were present for the start of Monday’s session, three of them were allowed to exercise the right to excuse themselves for reason of poor health, leaving only Khieu Samphan in the courtroom. Theary Sang, a human rights advocate representing some victims who are allowed a role in the proceedings, said it was fair to excuse the defendants because of their infirmity, but said it would be a shame not to hear their statements. Still, observers said the trial can play a crucial role in Cambodia’s coming to terms with its past. “There is an enormous amount to learn as the prosecutors present their case,” said David Scheffer, a former U.S. envoy for war crime issues who was instrumental in helping establish the tribunal. “And defense counsel probably will challenge evidence with their own revealing information about the defendants,” he said in an interview by e-mail. Testimony and presentation of evidence is expected to begin in August or September, 32 years after the Khmer Rouge were kicked out of power in 1979 with the help of a Vietnamese invasion. Lawyers for the defendants came out fighting Monday, giving a hint of points they may raise later. 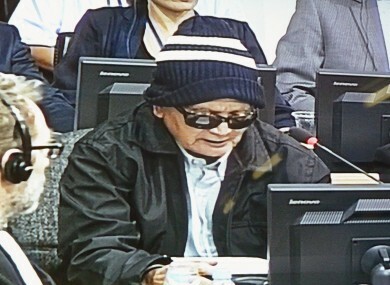 Lawyer Ang Udom reminded the court that Ieng Sary had been convicted and sentenced to death in absentia in 1979 by a Vietnamese-established court and that he received a royal pardon in 1996 when he led a mass defection to the government. However, the tribunal has already ruled he is still liable for charges. Michel Pestman, representing Nuon Chea, said a full accounting of the historical context of the Khmer Rouge should include a probe of the massive wartime U.S. bombing of Cambodia and Vietnam’s role. In recent months, the tribunal has been mired in controversy over what critics charge is an effort by the co-investigating judges — from Cambodia and Germany — to scuttle further prosecutions. Critics have suggested the panel is folding to Cambodian government pressure to bring an end to the trials. Cambodian Prime Minister Hun Sen, presumably wary that political allies who once served with the Khmer Rouge — as he did — could face prosecution, has declared he simply won’t allow further indictments. He has long sought to limit the scope of the tribunal. Email “"Killing fields" trial opens in Cambodia”. Feedback on “"Killing fields" trial opens in Cambodia”.